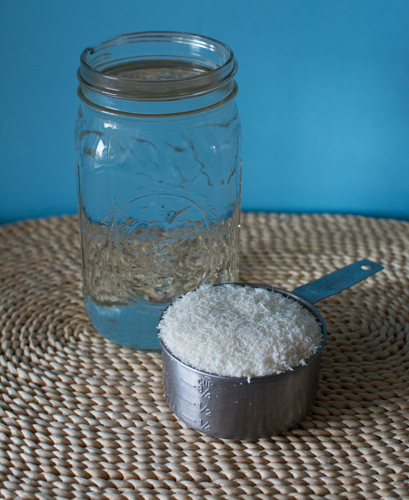 If you have shredded coconut on hand for making desserts or homemade coconut butter, I’m thrilled to share yet another useful way to use shredded coconut; you can make homemade coconut milk! We will then use that beautiful creamy coconut milk to make the best damn dark chocolate hot cocoa. All you need is a cup of shredded coconut and a full ball jar of water plus a little to account for what steams off and stays with the pulp. Add coconut and water to a medium-large saucepan and bring to a rolling boil. Stir to break apart any clumps and reduce to a low-boil for 15 minutes. Remove from heat and allow to cool for 10-20 minutes. Then place everything into a blender and blend on high for about 50 seconds (I used the whole juice setting on my Blendtec). Strain through a nut milk bag or fine mesh strainer to remove the coconut pulp. Store in a glass jar with a fitted lid and shake before using. Homemade coconut milk should keep up to a week. Add coconut and water to a medium-large saucepan and bring to a rolling boil. Stir to break apart any clumps and reduce to a low-boil for 15 minutes. Remove from heat and allow to cool for 10-20 minutes. Then place everything into a blender and blend on high for about 50 seconds (I used the whole juice setting on my Blendtec). Strain through a nut milk bag or fine mesh strainer to remove the coconut pulp. Store in a glass jar with a fitted lid and shake before using. *If you want sweetened coconut milk, add 2-3 pitted dates with the coconut - boil, blend and strain as normal. *A pinch of salt will bring out natural sweetness. *Add 1 teaspoon vanilla extract plus dates from above to have sweetened vanilla coconut milk. *Save coconut pulp in a bag in the freezer; add it to smoothies, oatmeal, or desserts. and now for homemade Dark Chocolate Hot Cocoa using fresh coconut milk! I swear coconut milk makes a better hot chocolate than almond milk. 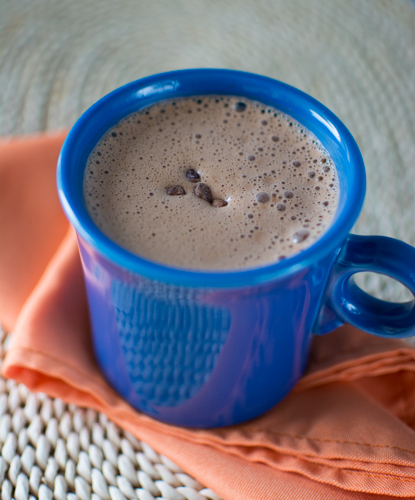 Rich, creamy, and chocolatey is how I would describe this heavenly cup. Blend ingredients in a small personal blender until powders are well combined. Then warm it in the microwave or on the stove. Recipe can easily be doubled etc to how many servings you need. Great recipe! I just made this coconut milk yesterday, and boy is it good. 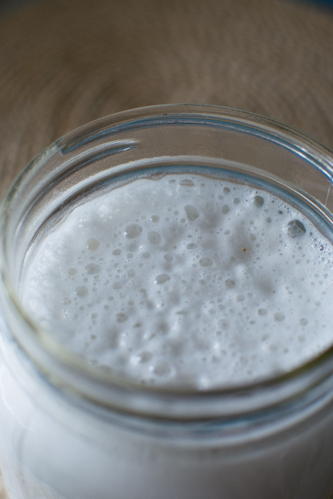 I have been contemplating trying to make my own coconut milk kefir, and I wondered if you have tried it? I even have a package of kefir grains in my refrigerator, all ready to go. But I would love some expertise to guide me. Hi Tori! I haven’t made my own yet but now that you mention it – I would love to! 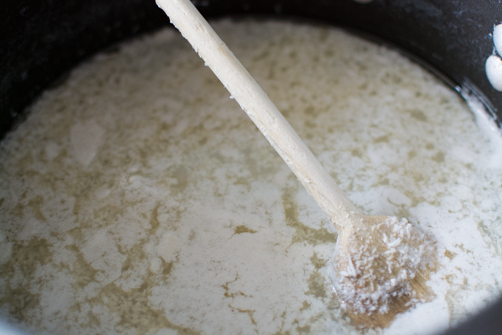 I found this helpful article http://www.thewellnesswarrior.com.au/2013/10/coconut-milk-kefir-experiment/ plus my Real Food Fermentation has a good recipe (his involves heating). I made rejuvelec once but that was awhile ago. Let me know how it goes. Cheers!